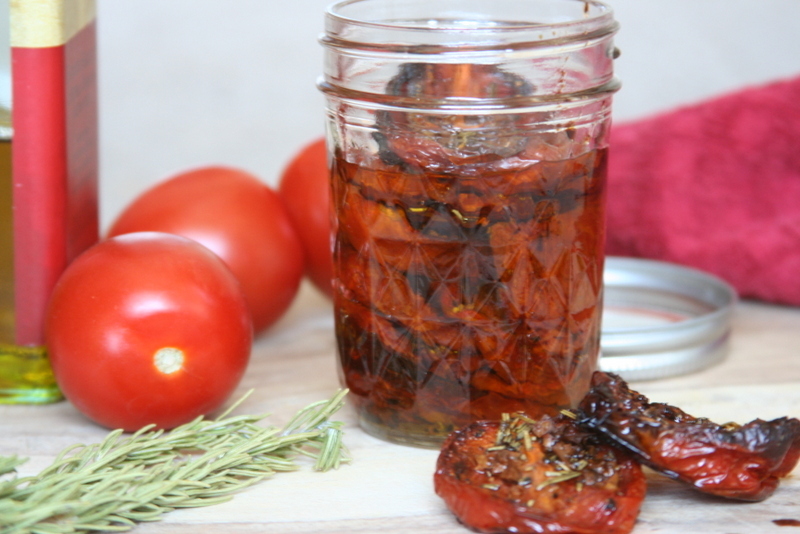 There’s nothing quite like the intense flavor of slow roasted tomatoes. If you’ve never had them, it’s a lot like sundried tomatoes only there’s a little touch of freshness to them that still remains. They are packed with umami, that 6th flavor category that means something like savory, but is perhaps more easily described as deliciousness. 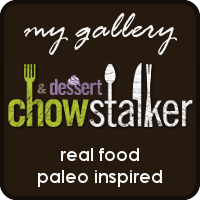 It gives dishes a depth of flavor and richness that is thoroughly satisfying and it pays to add bursts of umami to your dishes at every opportunity. One of the great things about slow roasting vegetables is that you can coax a lot of flavor out of something that might have been a little less-than-spectacular to begin with. At the height of summer, it’s possible to have tomatoes as they were meant to be – bursting with ripe, fresh flavor. But most of the year, they can benefit from a little boost. This is a solution to that problem! I was inspired to make these because this past weekend, we took down the last of my tomatoes from the garden. I was so lucky this year to be nearly overwhelmed by my tomato bounty! My backyard looked a bit like a jungle because the tomato plants were overgrown, unruly monsters. One of them even had a rosebush growing through it, which meant that every time I went to harvest the tomatoes, I had to brave the thorns. I have a few scars left to prove it! Now when I look out back, my garden space is more open, you might even say barren. When I look at it, though, it seems beautiful to me just as it is. More spacious, airy, and clear. I’m sure that I’ll plant in the spring and that it will be a giant tangle again next year, but I think I’m finally ready to settle in to the quieter months of winter. These tomatoes take a while to make, but the process is mostly hands-off so on an afternoon when you’ll be hanging around the house, take five minutes to slice a bunch of tomatoes, drizzle them with oil and pop them in the oven. When they come out, eat a few, because you pretty much have to, and then put the rest in a jar and cover them with your favorite extra virgin olive oil. After a few days, you’ll be rewarded with a deeply flavored roasted tomato oil that is exceptional drizzled on salads and maybe even better drizzled on eggs. 1) Turn oven to 275 degrees. There’s no need to fully preheat the oven, just prep tomatoes while it starts. Coat a baking sheet with a drizzle of olive oil. 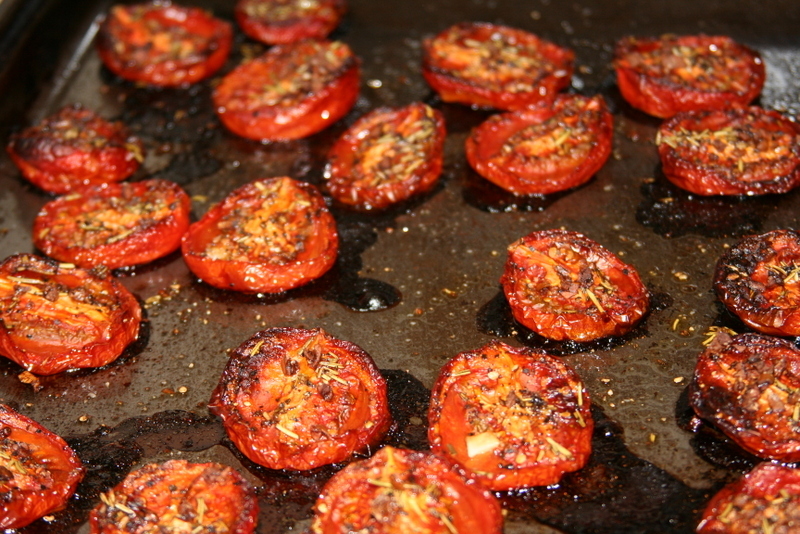 2) Slice tomatoes in half lengthwise and place skin-side down on the prepared baking sheet. Using a pastry brush or the back of a spoon, spread the olive oil on the open side of the tomato halves. 3) Sprinkle the tomatoes evenly with garlic, rosemary, and salt. Place in the oven and roast for 2 1/2 – 3 hours. 4) When the tomatoes are dried, they can be eaten as is or sliced and added to dishes for a burst of intense tomato flavor. Place tomatoes in a glass jar and cover with extra virgin olive oil. Leave to marinate for a few days and then enjoy in salads, omelettes, or next to grilled meats. I hope you like them! I could even imagine them cut into halves or quarters with a little selection of salami, olives, etc.